Rigid vinyl signs mounted on gator board are extremely rigid, flat, durable, and resistant to warping. They're the perfect choice for signs and displays that are going to be handled and transported regularly, such as trade show or real estate displays. Gator board is also a great option for point-of-purchase displays, mounted photographs, informational signs, menu boards, and long term signage. Gator board is a premium mounting board that has a strong, dent resistent surface. It's very rigid, weight bearing, and flat, which is why it's ideal for signs that are going to be handled or transported repeatedly. Gator board is also much more rigid and resistant to warping than other mounting boards such as foam core. It can be cut with most knife systems or can be fabricated with woodworking tools. We offer several thicknesses and print quality levels for our gator board signs, so we can accommodate virtually any quality and budget requirements you may have. 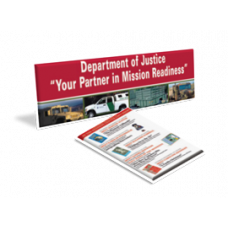 Rigid vinyl signs mounted on gator board are extremely rigid, flat, durable, and resistant to warpi..